Adventures with a Salmon rod: The Grilse have arrived! After last weeks despair about my broken rod, leaking waders and lost reel part i was hoping for better fortunes on the river this weekend as the water is looking better by the day and was sitting at 1.11 on the gauge and was running nice and clear and surprisingly cool for this time of the year. I met with Kevin, a friend of mine at 6 am. After tackling up we decided to fish the top part of the beat as there tends to be more Sea Trout up there which appear to take readily in the morning. The other added advantage is that the morning sun does not cast a shadow over the water. After a couple of minutes Kevin took a small Sea Trout of about 1 1/2 lb, not a bad start. We failed to connect with anything in any of the hot spots and only planned fishing half way up the top beat as it never produces a fish. I decided to keep on fishing up this morning as it all looked very fishy and with two of us we were covering water fast. As i got to the top foot bridge I threw a cast over the shallows on the far side and was amazed when i felt the take. Initially the fish did a fair bit of head shaking, then it took off! After several good leap and a couple of strong runs a lovely bright Grilse was ready for the net. After Poppy's usual effort to help by jumping in the river followed by lots of shouting from me i managed to bring the fish over the net. Unfortunately, the hook snagged in the mesh and the acrobatic little Grilse had one final leap and was gone. At least it saved me from handling it and stressing it out any more than was necessary. It was a very fresh fish of about 5-6lb and in pristine condition. Encouraged by the presence of a fresh run of grilse we made our way to the bottom of the beat with high hopes. We fished our way up through the lower beat methodically covering the entire river as the grilse tend to lie in places I wouldn't normally expect to find a fish. We were, very surprised to fish through the whole of the bottom beat without seeing a single fish. Once we got back to the middle foot bridge I decided to cover the north bank for the first couple of pools and was surprised when i was taken by a lively little Grilse, again, in the shallows. 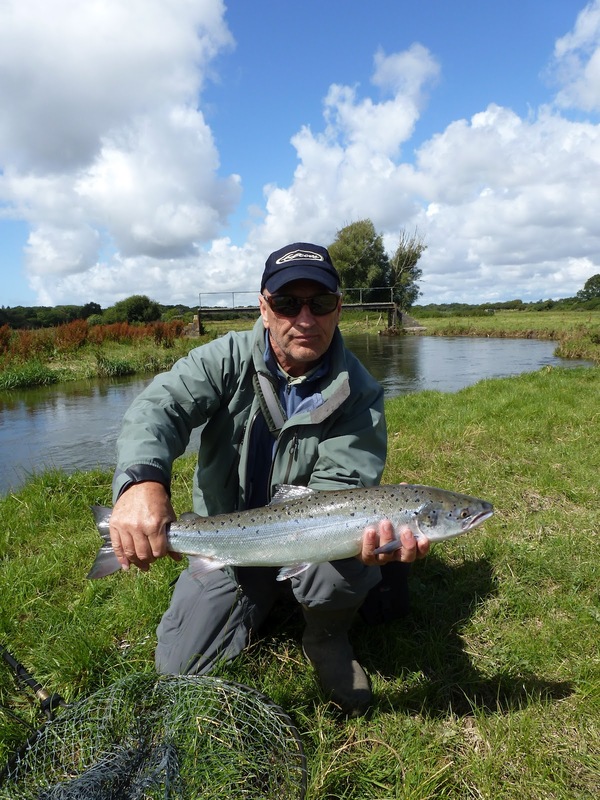 after a short battle the lively little fish of about 3-4lb was returned. This fish had a fair bit of damage, it looked like cormorant wounds, which is not surprising judging by the number of these birds present on the river. Next up was Kevin, i heard his shout and looked up to see him fighting a strong looking fish. This was another Grilse, again, very fresh and very strong. Like the other two fish this one came from a spot i have never taken a fish from before. As the day started to warm up and lunch was calling (and the Wife) it was time to head off. All in all a great morning and the arrival of the Grilse run is well and truly in swing! Nice report Paul, glad the silver tourists have arrived in your area.